The SMU field trip on November 27th is now open to all grade levels. The permission slips are available in the counseling office. Please have it submitted by November 12th at 3:00 p.m. We have 35 spots available for students with no discipline issues. Wear comfortable shoes, dress in school dress code for the weather and bring $15 for food. The Lake Ridge JROTC marched in the Mansfield Veterans' Day Parade on Saturday, November 10, 2018. Our JROTC was recognized as the 2nd best JROTC marching unit in the parade. Our cadets were also invited to city hall on Monday, November 12th, and Major Katherine Dressel waas presented with the 2nd place trophy during our city council meeting. Please congratulate Brittni Rufus as she signs to play softball for The University of Louisiana at Lafayette today. The Toys for Tots contest is in effect. Please bring new toys to your 2nd block classes. The class that wins will get a pizza party. See your teachers for details. Exchange a toy for a shirt. Bring two new toys to the STUCO store or classroom and receive a new Lake Ridge shirt. In observance of the upcoming Veterans Day Sunday November 11th, we want to know if you have family members that have served or are serving in any of the branches of military services. We will display their names and your names in a Veterans Day display at school and invite you and your family member to a breakfast on Monday morning November 12th. Please provide your name and your family member's name to our front receptionists or email Mr. Romaguera. Boys' Soccer Tryouts are Monday, November 26th. If you would like to tryout please sign up in Coach Elolf's room A-121 during advisory either this week or next week. Girls' Soccer tryouts will start Monday, November 26th (The Monday we return from Thanksgiving Break). Tryouts will be held after school. You must have a physical on file to be eligible to tryout. All students interested must be at the pre-tryout meeting in Coach Wallace's room, A-344, after school on Wednesday, November 14th. If you are trying for Girls' Soccer, please give your physical to Coach Wallace in room A-344 or Coach Rose in room P-153 by Monday, November 26th. The Lake Ridge Amnesty Club will have a meeting on November 15th before and after school in room A-232 please attend, if you would like to learn more about the club. The Football team is named Co-District Champs after defeating Summit High School 35 to 24. Congratulations to our Football team! The team plays next in the Bi-District Playoff game versus Lake Highlands on Friday, November 16th at 7:30 p.m. at Newsom Stadium. Friday, November 16, 2018 at 7:30 p.m.
*Convenience Fees will be added for debit card and credit card purchases. MISD badges will be accepted at the gate. Congratulations to the Lake Ridge Band for earning the most positions of any MISD high school within the MISD High School All-District Band at this past Monday's auditions, with 9 students placing first within their respective audition rooms. This is the 3rd consecutive year that the Lake Ridge Band has earned the most positions at District and currently comprises over 41% of the membership within the MISD All-District Band. Saturday, December 1, 2018 from 6:00-7:30 p.m.
Tickets are $12 for the dinner and the show. We will have a Student Council meeting Wednesday during all lunches. If you are interested in joining the Frisbee club this year, please let Mr. Meyer know. If we are able to get enough members we will play Mansfield High when we get back from Thanksgiving break. 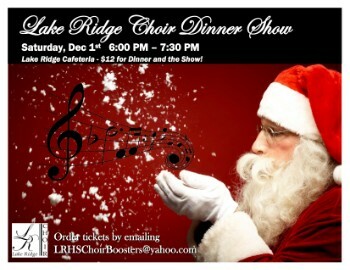 Come explore all the extra curricular activities that Lake Ridge has to offer on December 5th and 6th. The Ambassador club is hosting Clubapalooza during all lunches in the cafeteria.